"Selfishness and greed, individual or national, cause most of our troubles." For Azlesa nativities, the condition of conversational, commercial, discursive, explanatory, instructional, argumentative, businesslike Budha may considerably affect the outcome. QUOTATION from: Shil-Ponde.(1939). Hindu Astrology Joytisha-Shastra. p 82.
is their rather unpleasant and unsociable disposition. and their apparent reluctance to be gracious or kind to others. and is a barrier to progress. and learn to appreciate the good in other people. They should cultivate the habit of doing things for others." 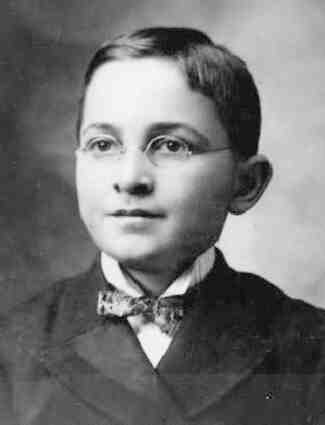 Bess and Harry Truman were the same age. They met in 5th grade and became friends, attending school together until they both graduated. 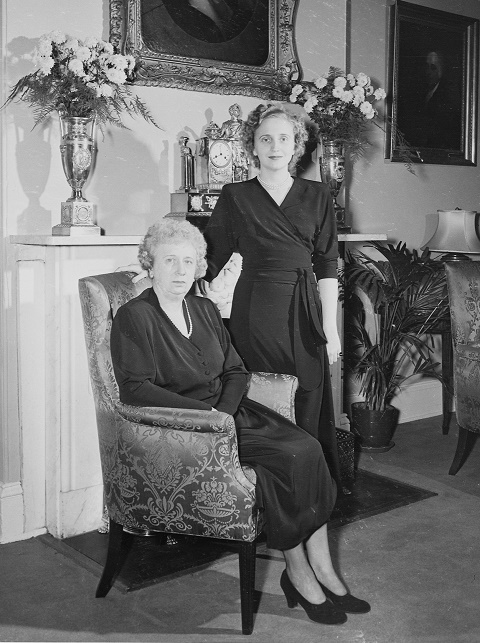 Mrs. Bess Truman and her daughter Margaret Truman in the Whitehouse, late 1940's. Dad was a farmer and livestock dealer. The family moved frequently for agricultural reasons, and the lost their farm during the Depression. Harry Truman was exceptionally close to his mother. Mom was continuously supportive of Harry in every aspect of his life. Mom stayed alive for a long time, supporting Harry until he was 63 years old. Until age 33, Truman lived in political and economic obscurity. Reflecting the strong maternal roots of Chandra-4, his foundational years were dedicated to fighting in WW-1 France (Chandra defense), doing heavy agricultural labor (Chandra farming), and living in Depression-era hobo camps while variously employed (Chandra camps). He had a strict childhood defined by his parents Protestant Ethic, and did not attend college (ruler of 4 in 12) but was substantially self-taught via personal reading. His fair complexion and pleasant appearance was influenced by the pale coloring of Zukra-ruled Chandra-4. However his potty-mouth was directly a function of nichha-Kuja-1 drishti to Chandra-4. "...when the Moon in Libra is aspected by Mars or Saturn , the native is supposed to become cruel." "... Saravali ascribes the following results: ...When Mars occupies Cancer and is aspected by Saturn, he will be a navigator , poor, beautiful, and engaged in princely trades ." Truman used the speech (Budha) of the common man (Shani) . A capable independent reader but lacking a college education (ruler of 4 schooling in 12-dissolution) Truman was familiar with written forms of university-register language but he was not raised around those who spoke in the educated style. Although Truman was a career politician and he was not distinctively honest, he was often hailed as an honest man because he spoke in the agricultural style, eschewing the conceptual and logical vocabulary of the educated classes. Thus he seemed more accessible to the working folk. Rahu-3 communications "seem" common-Rahu-Kanya. Uttama-Guru drishti into bhava-5 delivered just one child = his daughter Margaret. She was a noted pianist, and dedicated to both of her parents. 5th-from-Chandra = bhava-8 suggesting that Margaret knew secrets. Guru rules the emotionally conflicted 6th-from-Chandra ++ Brihaspati rules aristhana 6-war. Truman's Military battle service in WW-I was intensely promoted as key to his political identity as a man who understood military realities. During FDR's years of failing health, and considering that FDR had no military service record, Truman made many of the detailed military budget decisions which were then trustingly approved by a distracted FDR. Truman 'dropped the bomb' on Japan in August-1945, killing and maiming millions in Hiroshima and Nagasaki. The WW-2 Japanese military had already killed an estimated 6-10 million people in Asia, including a genocide of approximately 6 million Chinese and Southeast Asian peoples. Truman stood firm in his decision to attack Japan, despite some military opinions that the Allies had already won the war..
Truman's eyesight was compromised by childhood diphtheria (6) Yet, Truman managed to serve as a WW-1 military commander and worked as a popular 'machine' politician wherein remembering names and faces is critical to the job. Guru-yuti-Mangala-yogakara ++ Surya-Meza rules 2-eyes. 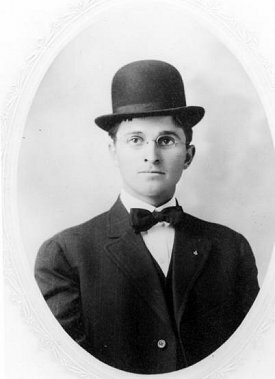 His spectacles successfully corrected most of the deficiency and gave him a distinctive, scholarly appearance. However in his homeland (USA) Truman is remembered as a Great Protector (Guru-Karkata) who ensured that even when the American military was was weakened and depleted from years of exhausting war on two sides of the world, that the once-fierce enemy (Japan) would be fully destroyed. Despite Budha's Shani-yuti fluency handicap, Truman was nevertheless blessed with a gracious Zukra parivartamsha Budha. His quotations were and still are very popular due to the balanced, simple, but yet elegant style of his aphorisms. After ending his POTUS service with a sudden lifestyle downshift during Ketu-Rahu bhukti, Truman lived for another 20 years, to age 88. Despite his panicked announcements during Ketu Mahadasha that he would be going on government relief due to poverty (Ketu emptiness) in fact Zukra ruler of 11 provided several sources of income, including pensions and his Memoires. He died in Zukra-Budha bhukti. 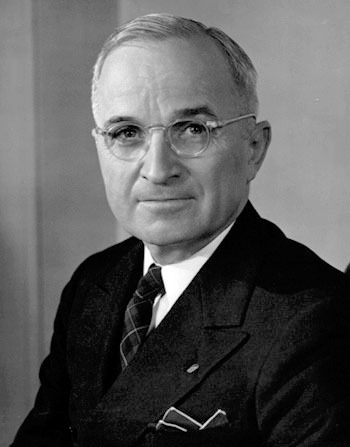 Truman's public approval rating at election time stood at an unthinkable 36%. Shani intakes drishti of Rahu-3. He rallied, making constant election speeches with a highly Rahu theme = civil rights. Many commentators of his day would have asserted that he obtained the presidency by accident. Truman was a largely unknown US Senator selected as a vice-presidential candidate to run with POTUS-32 Franklin D. Roosevelt in the 1944 election. FDR died four months after starting his third term, making Truman POTUS-33. Truman made the very controversial decision to end the Pacific portion of World-War-2 by authorizing the atom-bomb drop onto Hiroshima and Nagasaki Japan. It was widely believed that voters would not support Truman against the well heeled and educated Thomas Dewey. Shani-11 rules 8 = hidden earnings from governance roles including bribery and other corrupted wealth* for example, Mrs. Truman was said to have received gifts into her private home not registered with the public view. When he left government service he left the relationship between 11 revenue and 8 secrecy. At Truman's age 69, in 1952, POTUS-33 job was finished. After decades of government service ending with seven years at the highest levels of responsibility as POTUS and Commander in Chief, Truman returned to private life of near-penury. He was able to earn from sale of local land (sale of lands Guru rules 3rd-from-4th) and from his Memoires. 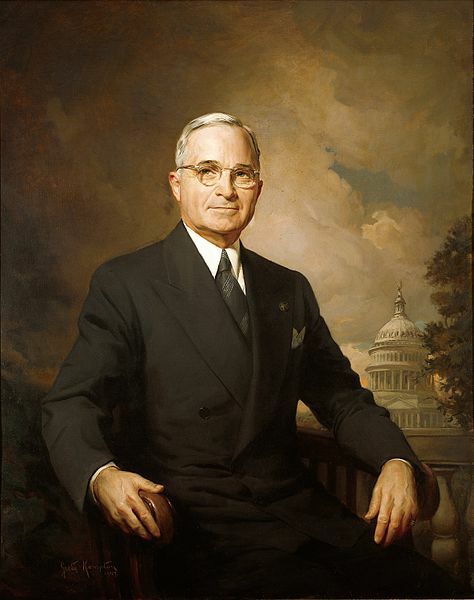 Truman's only elected term of office was 1948-1952. These four years were plagued by scandals and controversies, the suicide of his Secretary of Defense, and a 22% approval rating, among many other collapses. Truman appeared to become defensive and his wittiness seemed vulgar to many. 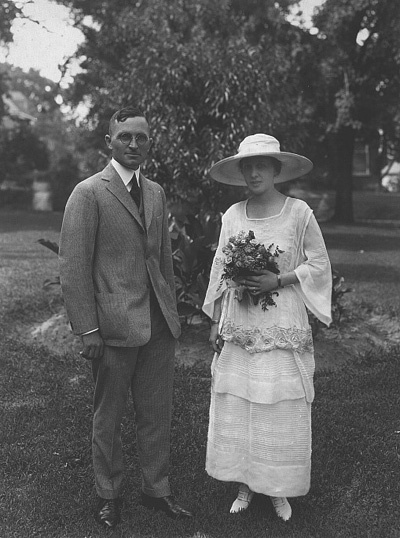 Despite his years of work in the public service, Truman and his wife Bess retired from the presidency into a state of penury. Historically it had been presumed that only the independently financially privileged whose retirement would be cushioned by investments would hold the highest national offices. Truman was the first surviving "test case" proving otherwise (other men of modest means had served as president but they had died in office or shortly afterward). Royalties from his Memoires began to flow in 1956. Also, Congress created presidential pensions in 1958. His Ketu-Mahadasha emptiness dissolved and he was well cared for until death age 88.